Carolinas Medical Center operates a dedicated 32 bed neurosurgical ward, a 22 bed neurosurgical step-down unit, a 4 bed neuro-monitoring unit, 14 bed pediatric ICU, and in 2010 opened a 28 bed neurological services ICU. Dedicated operating rooms include 5 neurosurgical inpatient and 2 neurosurgical outpatient ORs as well as a Bi-planar neuro-angiography suite. Intra-operative adjuncts including 3 image guidance surgery devices (stealth), state of the art neurosurgical operating microscopes, intra-operative CT, intra-operative neuromonitoring and two-way high definition telemedicine capabilities. Dedicated LINAC based radiosurgery device (BrainLab), non-invasive angiography (CTA/MRA), perfusion (pCT, Dyn Susc MR), functional (fMR) imaging study capability and PET imaging are also all available at Carolinas Medical Center. 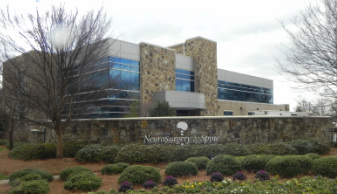 Outpatient clinical resources include the main office of Carolina Neurosurgery and Spine Associates located on Baldwin Avenue, exactly one mile from the campus of CMC. This state-of-the-art facility includes MRI, CT, X-ray, and C-arm with studies stored on the PACS system maintained by Carolinas Medical Center. A busy in-house physical therapy gym is utilized for referred patients. The Nextgen electronic medical record system is used and is available remotely. Residents will participate in clinic as assigned with their supervising physician throughout their training. Outpatient experiences during the non-neurosurgical rotations are performed in the clinics of the supervising physician in the adjoining buildings on the CMC campus. Each facility has modern imaging and lab capabilities. All Carolinas Healthcare System and Carolinas Medical Center physician offices utilize the same Cerner EMR system used in the hospital.